Mayor Bill de Blasio and President of the United Federation of Teachers Michael Mulgrew announce the deal at City Hall on May 1, 2014. Last summer, Michael Mulgrew told me, “We don’t pick winners, we make them.” Then the United Federation of Teachers president steered his union to an endorsement of Bill Thompson in the Democratic primary. The other Bill won, of course. But today, Mulgrew won too, thanks to a different, bigger bet he’d placed way back in 2009: That whoever turned out to be the next mayor, he or she would give the UFT a better contract deal than Mike Bloomberg. So Mulgrew, and other city union leaders, basically stopped negotiating with the incumbent five years ago. This afternoon, the waiting game paid off. 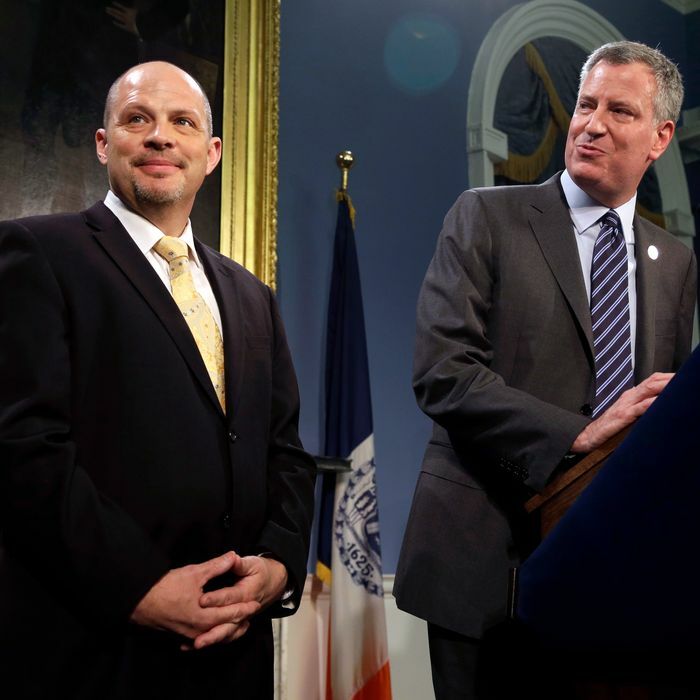 Mulgrew stood beaming beside Mayor de Blasio inside City Hall for the announcement of a contract covering nine years that grants the union $4 billion or so in raises, with annual increases averaging two percent. Plus a new process designed to empty the union-despised “rubber rooms” that kept incompetent or dangerous teachers away from public-school kids. And a simpler teacher-evaluation process. De Blasio appears to score major points, too. The year-to-year hit to the city’s budget seems modest. Innovations in work rules include bonuses for teaching in “underserved” neighborhoods. De Blasio says unfit teachers will be out of the profession more quickly. And the mayor may have bought himself labor peace through his re-election campaign — if, that is, he can get past the next several days, during which an umbrella group of other unions will vote on proposed changes to municipal health insurance plans. The PBA is already balking. If he pulls it off, the gains — to use one of de Blasio’s favorite words — could be “historic.” Yet the particulars of just how the city will be paying for the raises — or even the total cost of the raises — are alarmingly vague. Especially the $1.3 billion in “cost savings” de Blasio says will come from changes to union health-care benefits. At a press conference this afternoon, de Blasio, Mulgrew, and city negotiators referred to “a labor-management health care committee” to select from “a whole menu” of options for cost-cutting. Hmmm. Some of the possibilities include encouraging sick people to visit clinics instead of emergency rooms, and requiring greater use of mail-in prescription drug services. If those devices work, it would be a boon not just to city finances, but to proving progressives can forge a responsible health-care agenda. All of which sounds great. But so did de Blasio’s declaration at a triumphal City Hall press conference in February that he’d “saved” Long Island College Hospital. Two months later, the sale of the Brooklyn site is in turmoil yet again, and the highest bidder doesn’t want to build a hospital. Today’s announcement had a similar celebratory style, but it also had an abundance of irony. Mulgrew and de Blasio trumpeted this deal as a drastic improvement on how teachers were treated by the previous administration. True, the tone was often needlessly antagonistic in the Bloomberg–Klein years — but most teachers’ paychecks got healthier, with base salaries rising 43 percent between 2002 and 2009. Even in Bloomberg’s third term, the old contract provided automatic increases based on seniority. And de Blasio, unlike almost every new mayor in the past 40 years, hasn’t been forced to make budget cuts, inflict layoffs, or threaten to raise taxes upon arriving in office. Indeed, his proposed first budget adds spending to the Department of Education budget, and today de Blasio started doling out raises. Teaching remains a tough, vitally important job, and in a larger societal context, the city’s educators remain underpaid. Maybe the mayor is dodging disclosing the messy cost-saving details as a crafty negotiating ploy: By settling with the teachers, he’s established a powerful precedent, but he still needs to get 151 other unions to take similar terms. And maybe there’s a hidden provision in the UFT deal that the city can impose savings if the collaborative approach doesn’t deliver. But as Mulgrew and de Blasio declared victory today, the only sure thing was that now they’re very much in this together.